Overwhelmingly our most popular sprouter, Easy Sprout is also our personal favorite. We have well over a dozen in our house. 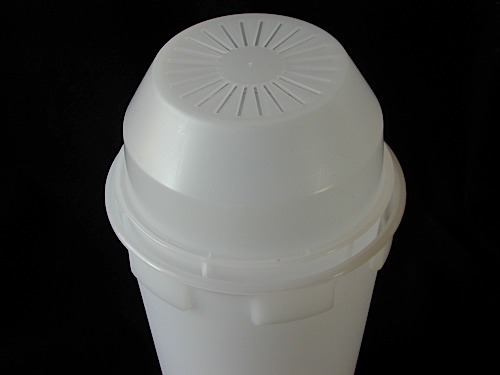 It offers great drainage and the best air-circulation of any sprouter. 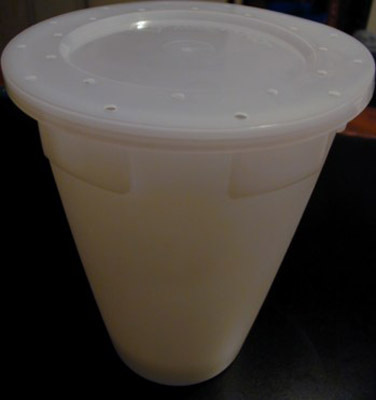 Easy Sprout is made up of a 1 Quart (litre) Growing Vessel, a Solid container/Base that catches excess Rinse water, a Small Seed Insert that snaps in when sprouting small seeds, two Growing Lids (1 for home (Domed) and 1 for the road (Flat)), and a Solid Lid for refrigerator storage of your sprout crop. Easy Sprout is the best all-around sprouter. Period. It is the mandatory choice for high humidity sproutpeople everywhere and great for travel sprouting! Very versatile - Easy Sprout can sprout virtually any seed, anywhere! Easy Sprout is part of many of our Kits. 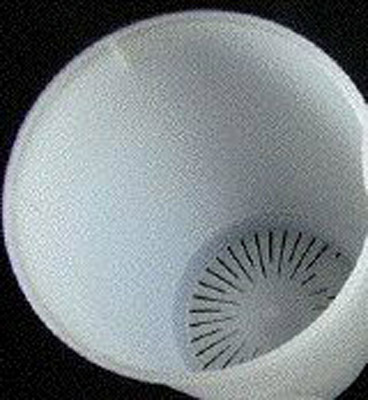 Since the Easy Sprout drains from the bottom it is the perfect device for cleaning your seeds prior to soaking. If you are sprouting small seeds, snap the Small Seed Insert into the bottom of the Growing Vessel. Put your seeds in the Growing Vessel and run water through them until the water runs clear. Place the Growing Vessel - now with clean seeds - into the Solid Base. Fill with cool (60 - 70°) water unless instructed otherwise by your seed supplier (us we hope =;-) and leave to soak for 8 - 12 hours - or for the time noted for the seed or mix you are sprouting. It is optimal to remove the Growing Vessel and hold it under your tap or sprayer. This allows you to use water pressure (we like our water pressure high). Make sure all of the sprouts get thoroughly wet by moving the Easy Sprout, or by moving your tap or sprayer. As an average we will run water through for about 15-20 seconds at every Rinse, but there is no hard rule. Always use cool (60 - 70°) water. If you need or prefer to use less water: Leave the Growing Vessel inside of the Solid Base. Fill it with at least twice as much water as you have seeds/sprouts. Twirl the Easy Sprout so that the seeds/sprouts swim round 'n round. As your crop grows you will likely need to use a fork or spoon to make them swim. 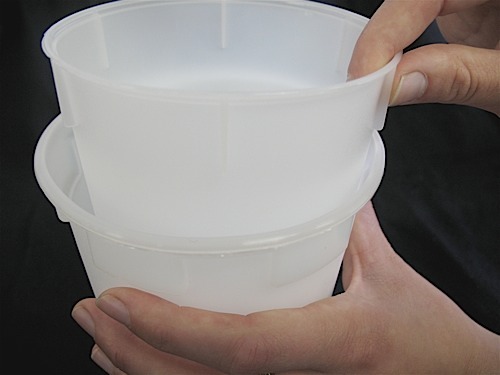 In between Rinsing and Draining, your Easy Sprout does best while set up with the Growing Vessel sitting higher than the Solid Base and with the Dome Lid resting on the Growing Vessel's lip (the Dome Lid may be dome up or dome down - it makes no difference). 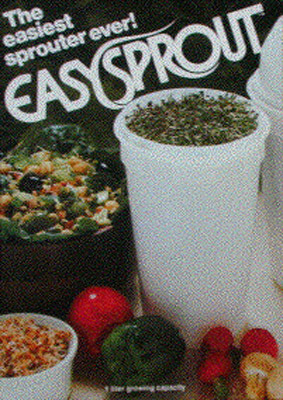 But, since all Easy Sprouts sold since fall of 2000 include the modern design, you have the option of 1. Not elevating the Growing Vessel and 2. Using the Flat Vented Lid instead of the Dome Lid (The Flat Vented Lid was designed specifically for Travel Sprouting), but do as you will. Bounce the Growing Vessel against the side of your sink, Shake it, Spin it. You can't break this wonderful device so go for it! Get all the water out after each rinse because as we know - seeds will not germinate in standing water and sprouts that sit in water will rot - which smells really bad. We always suggest a low-light, 70° location for your sprouter, until it is time for Greening (if you are growing sprouts that green - like Leafy or Brassica sprouts). At that point we say to move your sprouter to a well lit location. Easy Sprout, though partially opaque, will allow in plenty of light to get your sprouts to go green - well - those around the outside anyway. Even though it has remarkable air-circulation, you don't want to put it in direct sunlight as your sprouts could cook. So concentrate on that other thing we say: You'll be amazed at how little light it takes to turn your sprouts green! Before Harvesting any crop, it is essential that you Drain it Very Thoroughly after your final Rinse. Storing crops that are dry to the touch, maximizes their shelf life. So pay especially close attention to this: Drain thoroughly! If you are growing Leafy or Brassica sprouts, you can use our De-Huller to remove any remaining hulls, and dry your crop at Harvest time. If you want to Store Your Crop using Easy Sprout, all you need do is snap the solid lid atop the Solid Base before putting it in your refrigerator. Do leave your sprouts in the Growing Vessel if you're storing in Easy Sprout. If you have a particular seed type in mind, read on to discover further details of Easy Sprouting that seed type. Refer to the seed's main information page for detailed instructions. Alfalfa, Clover and our gourmet Mixes. One issue folks have with these sprouts is that they expect them to be green. There are almost always - regardless of the sprouting method - some sprouts which will not turn green, because some sprouts grow under or behind those on the top or outside of the crop. Our advice is: Live with it! Most will green if you don't over-crowd the sprouter (use 2 Tbs. - or less, of seed) - and those that don't are still plenty delicious, nutritious and they add beauty - yellow goes well with green and white (roots)! These also will do better if they are allowed to move freely, so break up the mass on day 4 and 5. It is not a critical issue with the Leafy Sprouts, but it does have the added benefit of allowing hulls to float away if you break them apart while submerged in water. To get some hulls out along the way, leave the Growing Vessel in the Solid Base, fill with water, stir around and break up the mass of sprouts, gently with a fork. Skim the hulls off and compost them. Maximum dry seed to Soak is 3 Tablespoons, but that will seriously crowd them. We generally use 2 heaping Tbs. for a big crop. Broccoli, Radish, Cabbage, Mustard, etc. Need to move while sprouting or they will form a root mass which is at least unpleasant and often lessens the sprouts' quality. Solution: Rinse with high water pressure. The intent is to make the sprouts "dance". Often by day 3 or 4 your sprouts will be in too tight a mass for the water pressure to dislodge them, so take a fork or use your hands to loosen them up. Alternately, you can transfer the sprouts to the Solid Base, fill it with water, use the fork or a clean hand - it is often easier to break up the mass while they are in water. Keep breaking up the mass at every Rinse or two. Maximum dry seed to Soak is 4 Tablespoons, but 3 Tbs. is best. Maximum dry seed to Soak is 1.5 cups (except mung beans) - that will totally fill the Easy Sprout (and possibly then some). Mungs will grow bigger thicker roots if weight is applied to them. We use 2 Easy Sprouts. We fill the Solid Base (of the Easy Sprout that we aren't growing in) 2/3 full of water and snap the Flat Solid Lid onto it. We then put that Solid Base right on top of the beans between Rinses. The other key to Mung sprouting is to keep the seeds/sprouts in place. Rinse with a sprayer (if your sink has one) and keep the water pressure low enough to keep the beans from moving. This will make the roots grow down (it's a nature thing) and because space is tight, the roots will grow thicker (it's a mung thing). Mungs are the only bean sprout we do this with, though we have seen Soy Beans done this way also. Here: After the initial Rinse - following the Soak period - apply weight to the beans by resting the 2/3 filled Solid Base of a second Easy Sprout directly atop your soaked mungs. When you Rinse 8 -12 hours later use a gentle spray - Drain well but keep the seeds movement to a minimum. Re-apply the weight. 8 - 12 hours later Rinse and Drain again; keeping the seed/sprout movement to a minimum. Keep repeating this Rinse/ Drain/weight thing until either your sprouts are done or they grow too high to allow the weight to stay put. If they grow that high; discard the weight and just Rinse and Drain until your sprouts are done - which is usually 4 - 5 days. One other thing we do - which is of course mentioned on the Mung Bean page, is to submerge the sprouts in water, for about 20 minutes - on the 3rd and/or 4th day. Having grown as many tons of Mung Beans as we have, we have developed our own methods, beliefs, and maybe superstitions. Whether this step does anything I can not say for certain. It seems as if it does, which is why I keep doing it, but I don't know why it does anything. Easy Sprout makes this very easy, of course. Just leave the Growing Vessel inside the Solid Base at Rinse time, and fill it with water. Do this only when your beans are firmly in place, we don't want them to float apart (a few on top will likely float, but that's OK). We Rinse lightly after this submersion. Why? Dunno. Maximum dry seed to Soak: We STRONGLY suggest you use no more than 1/2 cup of seeds in your Easy Sprout, until you have gained some experience and feel comfortable experimenting. Read more here. If you are growing these like other beans - with tiny roots, you can max out at 1 1/2 Cups. Follow Seed and Sprouter instructions, there's nothing else you need to know. Maximum dry seed to Soak varies, depending on the seed/mix you are sprouting. See the detailed instruction pages for details. Follow Seed and Sprouter instructions. Maximum dry seed to Soak is 2 cups. If you insist on trying this, start with 1/4 - 1/2 cup of seed and allow it to form into a mass by rinsing with low pressure water. Drain gently. Roots will form and plants will grow. Remember - we did not suggest this was a good idea so don't complain to us about how it comes out - speaking of which - be careful to remove the roots by cutting or you might break this un-breakable sprouter. You really should not even try this - it won't be pretty! Our favorite all-purpose sprouting device, the Easy Sprout has: Excellent Drainage, Superior Air-Circulation and is the most forgiving sprouter ever designed. Devoted Sproutpeople everywhere worship it. We have well over a dozen Easy Sprouts in our home. We have used them, almost exclusively for many years. They're extremely durable, easy to clean, dishwasher safe, will sprout virtually any seed, compensate for hot, humid conditions with a dynamic air-flow design, and are inexpensive. Easy Sprout is 3 1/4 inches on the bottom and 4 1/2 inches on the top. It is 7 inches tall. It has a 1 liter/quart capacity. 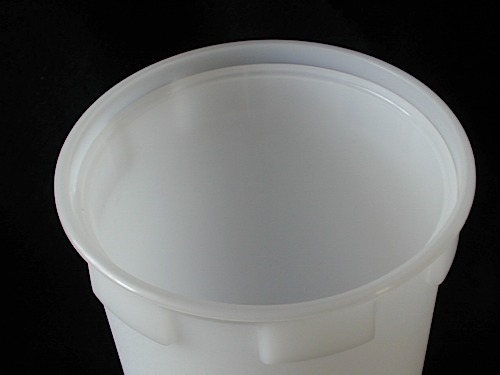 It is made of High Density Polyethylene (Fortiflex® T50-3600 HDP) - which is one of the few non-leaching plastics. The Easy Sprout is also Kosher - we kid you not. It came to the inventor Gene Monson in a dream, in the late 1970's. He has spent his life since, spreading the word of Easy Sprout. 6) Flat Vented Travel Lid. Growing Capacity One Quart. It can produce up to 1 pound of Leafy Sprouts or 2 pounds of Bean or Grain Sprouts. Excess water drains into the solid base (though you still need to drain thoroughly), so you can leave it anywhere without worrying about making a mess. With the snap on Vented Flat Lid, you can take your Easy Sprout(s) everywhere you go. Now you can Easy Sprout while travelling! The Easy Sprout is able to sprout just about any seed well. That is a big part of why we recommend it so highly. Mung Beans - Of all our sprouters, Easy Sprout is by far the best for growing big, thick rooted Mung Beans. One of the keys to growing these is the ability to apply weight directly to the growing beans. 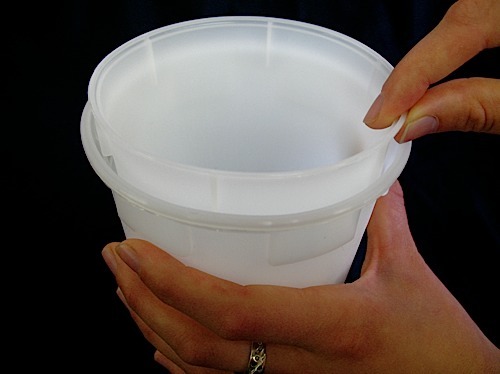 We use a second Easy Sprout's Solid Base and Solid Lid, to hold water. It makes the perfect weight, and it fits perfectly into the Growing Vessel in which the beans are sprouting. You should soak 1 cup of Mung Beans if you want to grow the biggest thickest roots as the mass created by the high volume of beans will aid in the root growth. Exotics - Garlic, Dill, Fenugreek, Onion, etc. Grains - Amber Waves, Wheat, Oats, Barley, Spelt, Rye, etc. Nuts, Seeds and Pseudograins - Market Mix, Almonds, Pumpkins, Peanuts, Sunflower, Buckwheat Groats, Quinoa, etc. Pre-Sprout The Easy Sprout is also a great Pre-Sprouter for: Grass, Greens and certain Micro-Greens. Grass - Neither Grass nor Greens will grow well, in the Easy Sprout, but it can be a fun experiment. Grass will grow without soil and can stay moist in the Easy Sprout - and get quite tall. It takes longer without soil, but in theory you can juice the entire mass (grass, grains and roots) so it may be worth a try - just for the fun of it. The depth of the device is the only issue, but they all grow fairly well without soil, so give it a try if you're looking to EXPERIMENT. Other Greens and Micro-Greens will not work well - even as an experiment. Most require more horizontal freedom and some (the sunflowers especially) do much better with soil. But - don't let us stop you from trying! You should remember that some of the Micro-Greens are mucilaginous and therefore form a sticky gel sack. Those seeds will make a mess of your sprouter and they will never sprout! If sprouting small seeds like Alfalfa, Clover and Broccoli snap the Small Seed Insert into the bottom of the Growing Vessel. You will hear it snap into place when you push it to the bottom of the Growing Vessel. Note: Once in a great while a Small Seed Insert will cease snapping into place. To remedy this, take a pliers (needle-nose is perfect, but any will do), and slightly crimp the lip of the Small Seed Insert in 3-4 places - spaced evenly. Voila! For Soaking: Place the Growing Vessel in the recessed position, inside of the Solid Base. The Growing Vessel is shown here in a recessed position, where the rim of the Solid Base (2) is higher than the Growing Vessel. When Rinsing: Remove the Growing Vessel and hold it under your sink's tap, or sprayer. In between Rinse/Drain cycles- make sure the "Hangers" (I sometimes call these "teeth"), on the outside rim of the Growing Vessel are sitting on top of the "Bumps" on the inside of the Solid Base. Rest the Dome Lid - in the upright (or inverted - if your seeds/sprouts are lower then the lid is) position - on the lip of the Growing Vessel. Note - the Dome Lid does not snap on - it just rests there. Note - Though it is theoretically unnecessary to elevate the Growing Vessel during sprouting, we think it is good practice to do so - especially in hot/humid conditions, when any extra air-circulation is helpful. While Sprouting (between Rinse/Drain cycles): Set the Growing Vessel inside the Solid Base and snap the Flat Vented Lid onto the Solid Base. Though the Flat Vented Lid is specifically for Travel Sprouting, it can be used at home - if you insist. Don't forget the Small Seed Insert, if you're growing small seeds into sprouts. Replacement Parts: When you purchase an Easy Sprout, you get everything you need. Every box contains all 6 parts. Folks do misplace a part now and then, so we offer some of the parts individually. 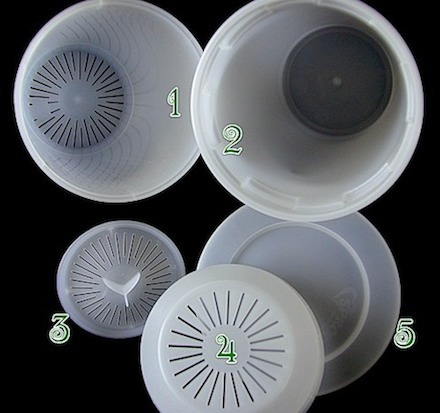 We offer the Small Seed Insert, the Flat Vented Lid, and the Flat Solid Lid. Follow those links to get to the pages where you can purchase them, if you need them. Manufacturer's Instructions: We love Gene, the inventor and producer of Easy Sprout. He is a true sproutperson. The greatest of them all! But, his instructions - which accompany every Easy Sprout - are off-the-wall. Other sprouters have zany instructions as well, but Gene's are the zaniest. We have, since day one, pleaded with our patrons, to avoid them - instead suggesting you follow our instructions. We're saying the same thing here. Read them, enjoy them, experiment with them when you feel you are up to the challenge, but PLEASE use our instructions. You'll get the best possible results when you do. 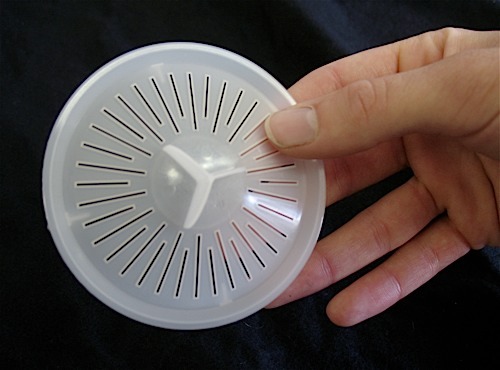 The Easy Sprouter is very easy to use. It only takes a couple minutes per day to nurture the seeds to sprouts. But, I am wasting seeds because the Small Seed Insert doesn't snap in hard enough to stay in place. A small stream of water or a circular hand-spin to drain the seeds knock it out of place and seeds fall through. I'm open to suggestions, but it seems that the manufacturing has made the insert just a tad too small. Other than this, the sprouter is genius and fun. Grab a small pliers and crimp the edge of the insert in 3 places. It'll snap. I am new to sprouting and bought this sprouter from sproutpeople per their recommendation. I followed the directions from sproutpeople's video. Even when I'm in a rush and don't vigorously shake out the water, I have never had mold or bad smell from sprouting in this sprouter. The sprouts turn out great and have a green, crunchy freshness. Best sprouter, especially if you're a beginner! I've tried several types and by far this is the easiest and most productive. Living in Hawaii the humidity made it difficult causing mold and I couldn't get it dry enough. But, it's not a problem anymore. I love this item. i have 3 and would probably have more but i have a very small kitchen. I have been sprouting with sprout people for many years. i only buy my seeds from Sprout People..
i used to use the mason jar method which i really liked but the Easy Sprouter is easier to handle and lighter weight and unbreakable.It really does drain better then the jar method. In my experience. my fav salad is chopped apple, a blend of different sprouts topped with Madison Mix with homemade Italian salad dressing. i eat this everyday sometimes twice a day. i hardly ever eat salads made with leaf lettuce anymore. I love this sprouter. I've used many since the 70s with varying degrees of success. I got good at it, but I really like the convenience of this one. It's so self sufficient, I practically just talk to it and it gives me sprouts. Thanks for inventing this great tool. This device results in the most pleasant sprouting experience I have personally ever had. So much easier than using a mason jar and cheesecloth top. I ordered two of these along with a leafy seed sampler and a bean sampler. I have never sprouted seeds before and am known for killing everything I try to grow. I followed the instructional videos on this website and had perfect results with the San Francisco Mix and the Alfalfa sprouts. I am going to be ordering another cup next month with some more seeds. I am loving this and FINALLY feel successful in growing my own food and making my morning green smoothies a little more affordable. Try the San Francisco Bean mix snack recipe on here. It is absolutely delicious. Thank you so much Sprout People for doing your videos and making this so accessible and affordable. 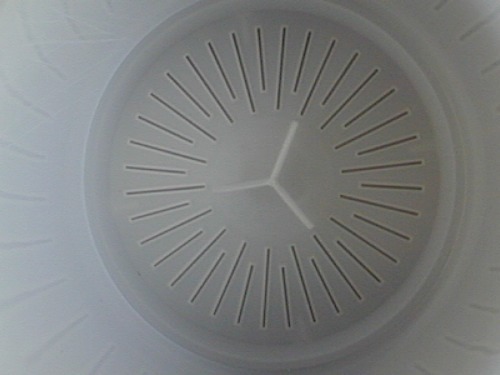 I also ordered the Oxo mini salad spinner and it worked like a champ. Just returned to sprouting after many years away. First went back to glass jars and once again remembered the many nuisances of using them. When I read about the Easy Sprout Sprouter I was sold. I bought six and I've been using them regularly ever since. I'm ordering some more today as I expand the varieties of sprouts I'm growing. Also love the many pre-mixed sprout combinations Sprout People offer. I now have 3 of these sprouters. I love them. Simple to use and easy to clean. Produces plenty of sprouts. I see more in my future.